A ProNuke troll that frequents blogs and websites to throw out lies and it always a cheerleader for nuclear, Michael M**n made some big claims on how well they test their gensets which are the backup power source for nuclear power plants. stock here-- my assertion has always been that even at Nuclear Plants, the backup generators are not tested under the real world conditions that they are needed in. 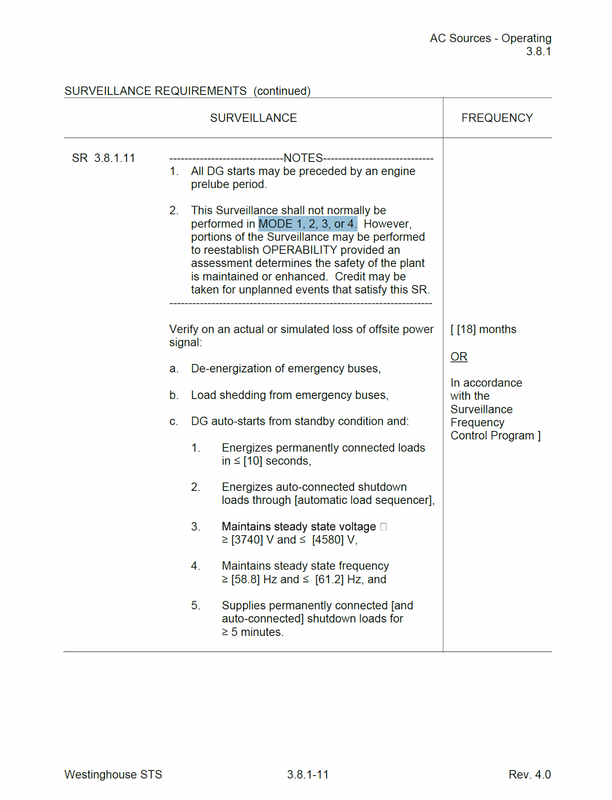 This means testing them support all the real loads that have to run in an emergency, including making sure that all the switchgear operates properly and automatically. M**n says he works for Ginna, a very old plant that was SOOOOO convicted of fraud that they paid over $200M in fines in 2012. Then a few years later, 2015, Ginna announces that they are not making a profit, and then a bogus study is produced to show that Ginna is necessary for the power grid stability, and then the captured regulatory agency decided to let Ginna charge rate payers extra costs per month, up to $45 per month per family. But aside from all that, M**n pointed out a link to a technical spec on Westinghouse Reactors. The link goes to a 570 page document, which is often table formatted and not as bad to read as you would think. However it does rely on other information that if you don't know what it means....then it might take you a long time to find it in the proper context, I will give an example below. There are two MODES where the reactor is critical (MODE 1 with the reactor power level above 5 percent and MODE 2 with the reactor power level less than or equal to 5 percent). There are three MODES where the reactor is not critical (MODE 3 with the reactor water temperature greater than or equal to 350°F, MODE 5 with the reactor water temperature less than or equal to 200°F, and MODE 4 with the reactor water temperature between 200°F and 350°F. And there’s MODE 6 where the reactor is shut down with one or more of the bolts holding the head on top of the reactor vessel loosened. Here is how I like to present the information: Clarity is power. 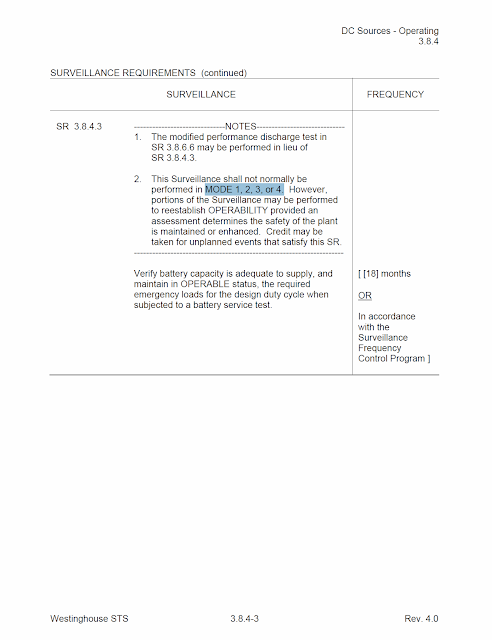 The "real tests" of making the Gensets (DGs) carry the actual emergency loads is not allowed in the above red highlighted Modes....ie.. when they are running or warm. See screen capture below. Note that the "Real Test" is only required every 18 months. However, the "Real Test" cannot be conducted while the Nuke is running or even warm. And they like to run these plants as long as they can to maximize profit. In fact, one of the oldest and most dangerous plants in the USA, just coincidentally on May 9, 2015 was pushed into a record run of 683 days. Not only is this absurd to take an old plant and force it into a marathon, it is absurd to not properly test the DG backup systems during this Clunker Marathon. We keep hearing about backup after backup after backup, which is not really true. Many of the backups can be broke and they can still operate the plant, legally.